I recently went to Barcelona and visited the Sagrada Familia there. It's an awesome building and if you have the chance I recommend a visit. The pictures really do not do it justice. Whilst the Sagrada Familia is a Antoni Gaudi design, much of the construction has occured since his death based on his ideas and designs. The Passion Facade was actually designed by Josep Maria Subirachs who was working from what he thought Gaudi's intention had been. So I decided to make my own min version of the statue, by starting from the sketch and sticking with a fairly cubist design. Once I had the model, I created a few CAM paths to cnc it out from some high density model board. Which takes detail really well and it quite easy to machine. I wound up doing a face operation to flatten the stock, then a 3d adaptive clear with 1mm clearance from the model to remove the bulk of the material. Then a parallel pass with 0.3mm stepover using a 3mm ballnose bit. And finally with a 1.5mm flat bit I did another parallel operation but with rest machinging switched on, so it only cut in places that the previous 3mm bit could not reach. This helped pull out some of the finer details and sharp internal corners. The above is what it looked like after the machining. There was still quite a bit to do with the file to clean up the edges, I sanded all the faces to try to remove any tooling marks, and filled all the details in. Once I was happy with this master, I cast it in silicone. Basically I stuck it down to a sheet of mdf, then built some little walls around it to form a shape, then poured on the silicone rubber and left it to set. Now that I have a mold I can easily produce many copies of the model. My first attempt I used a concrete mix. However that did not work well. The agregate in the mix was too large, I didn't really mix it right, the whole thing just was note well suited to something at this scale. Instead I bought some Jesmonite. This stuff is pretty amazing. it comes as a powder and fluid, it mixes up fairly fluid and pours in the mold quite nicely. It sets up in about 30-40 minutes, but continues to harden over a few days I believe. By default it comes out quite white and stone like which is really nice. It can also be coloured with pigments. Again I needed to file some to clean up anywhere it spilled over the mold, but generally the castings came out great. The only issue I had was with the sword/lance type thing the Knight has, it's quite a thin section and it was very prone to snapping whilst I tried to de-mold. To resolve this I found some heavy gauge copper wire from some house electrical wire (the kind that is actually quite stiff used to wire up plug sockets). a length of this stipped of it's inuslation dropped into the length of the sword and overlapping into the head of the horse seemed to work perfectly to provide a little extra support here, and I've not broken a single one that I did this way. Lastly I made up a quick oak mount to put the model on. My idea was that this would work well as a book-end on a shelf in my study. So I made up a simple bracket for that, and shaped a piece of oak to form a 'terrain' beneath the horses hooves. Which you can see at the top. Now available from our shop! custom pi Zero cases. Yes you can buy off the shelf cases for your pizero. and that's fine. But if you're building a project and looking for a professional finish, it's great to have a case customised to your project or business. Pi Zero sitting snugly in a custom cast case. Made from high grade J-Cast 70D hardness plastic, these cases can be drilled, and etched to custom requirements. Since we're making them to order they can be made in just about any colour you require. Part of the customisation is to etch your logo or project name right into the case. The cases are sealed with 4 torx screws from the bottom leaving the top surface clear for your sticker or design. the maker geek branded pi0 case. Need something more custom? or for a different kind of board? feel free to contact us with your particular requirements and we will see what we can do to help. Some time ago I decided to make myself a watch stand. I don't have a bed side clock, and since I take my watch off to sleep it seemed it could do double duty and be the 'clock' on my bedside table. I was pretty happy with it at the time, and I've used it for a couple of years. However over time the failings in this design has become more and more annoying. The first issue is that the round that the watch is wrapped around is not quite big enough. I miscalculated at the time and so the watch hangs quite loosely on it. The second, and much more serious issues, is that when the watch is in place the whole thing is front heavy. It is very prone to tipping over. Particularly when I'm putting the watch in place. I must have had this fall over and off my bedside dozens and dozens of times. So I finally decided to make a new one. Attempting to fix the problems of the first, and also to come up with a different design. I could have just made the same thing again, but with better balance and a larger center. However I thought it would be more interesting to design something actually different. That thinking actually lead me to make two new watch stands, trying out two different designs and two different materials. One in wood and one in metal. The wooden one is a fairly traditional and simple design. A central block that the watch closes tightly around with a peg through it that rests in a cradle. This is nice because I can lift the central block free of the cradle to add or remove my watch. Then set it back down. The weight is central and the whole thing is nice and stable. It also holds the watch face right where I want it. The metal one by contrast is adjustable, the central 'hub' has two nuts welded into it, and the front and rear plates screw in and out to adjust to the size of the watch. This design is in some ways more complicated, but in others more basic. The structure of the stand is essentially the watch itself. The metal 'skeleton' simply adds rigidity that holds the watch in place. A few weeks on and I haven't really decided which I prefer. I mostly alternate between them. I think the wooden option has a nicer tactile feel. But there is something about the bare bones metal one which I enjoy the look of. Below I have videos of me making each one. Which do you prefer? Last year we installed a log burning stove in our living room. It's awesome and I'm actually looking forward to the cold weather as a reason to use it again. This year we will be playing host to my family including my nieces and nephew. So the question of how we ensure that an exuberant child doesn't accidentally lay a hand on the hot outer surface. The answer of course is a fireguard and that sounds like an excuse to fire up the welder! For design I looked to our lights for inspiration. They set a tone for the room and I wanted to echo the pattern in the fire guard. Or just use a hack saw. For anyone shooting and editing video, sooner or later you realise a desire to have some more dynamic shots. Simply cutting from one static position to another can only take you so far. Even with a good timelapse, it can add a great deal of visual interest to have the camera moving during the period. So how to achieve these aims? Enter the motorised camera slider. These can be purchased in varying shapes and sizes ranging from 100-600 pounds. The function is simply to slide a camera smoothly along under motor control such that you can adjust the speed of movement to your needs. The more expensive ones will also pan the camera. This is particularly useful if you want to make videos of yourself, or a specific subject that you want to keep somewhat centred in the frame whilst moving around. Saw - just to rouh cut scraps to size as necessary. This design is based loosely on some cnc axis designs I've seen. Except where in a cnc built timing belt is used to ensure very precise movement and torque, in this build I'm just using string because it doesn't matter a huge amount if things slip slightly. it also reduces the cost and need for special parts. another good reason for this design is the flexibility over length. you can run the string as long or short as you want. All of the complexity is in the cartridge so once that is built you can change the track easily for differing lengths depending on your needs. In my case I have kept the electronics separate, and so trail the motor wires back and forth with the movement. It would be equally possible to mount the electronics on the moving platform and provide power as the only cable, or even to mount batteries to power everything. The linear motion is provided by a motor shaft turning against the string under tension. The tension provides enough grip to move rather than just slip. To maximise the grip, the string is wrapped around as much of the shaft as possible which is achieved with a couple of v-wheels mounted beneath the motor to guide the string through a narrow path up and around the motor shaft. The shaft of the motor itself is too small and slippery to work well, so I turned a small piece of delrin to fit over the shaft, and provide a v-groove for the string to sit in. this avoids alignment issues pulling the string off the shaft. To fix the delrin onto the shaft I drilled a small hole into the side and screwed in a 3mm bolt. The delrin is soft enough that it didn't require tapping first, it just carved its own threads and holds strong. Then I made the idler v-wheels that just guide the string. These are standard skate bearing (608) which are 22mm diameter. I turned some delrin to have the external profile I wanted, another v-groove, then bored out the centre to fit the bearings. I checked frequently as I approached the internal diameter to ensure I did not overshoot. Ultimately I wanted a tight fit, tight enough that I needed a hammer to tap them into place. With those components made it is a question of mounting everything in place. I decided to base my platform off of a small section of wood. In my case this was recovered from door frame that I removed. I drilled 4 holes as even spacing down the length of it. The two centre holes are going to be mount points for the idler wheels, so need to be spaced far enough apart for those to fit, whilst close enough to feed the string through a fairly narrow channel to get a good wrap around the motor shaft. The other two holes are just for stability so can be further out. I put a bolt through each hole with a pattern of nuts and bearings to act as wheels for the platform. So the holes you drill need to be close enough to the bottom of the wood that the fairly small bearing diameter will reach past the bottom. Alternately you could turn additional covers for the bearings to increase the diameter to make lager wheels. With the 'wheels' and the v-groove bearings mounted along the base piece, I could build up mounts for the motors that would drive the motion. For linear motion I mounted the motor above and beween the v-groove bearings so that the string could pass up and over the shaft. I found that the platform wanted to try and pull off course a little, probably because the motor shaft wasn't precisely alinged with all the wheels. So I made some guides to run along the other side of the track to keep things running straight. The the motor for the rotation could sit on the platform with its spindle pointing up. Initially I just had a single belt passing around the motor spindle and the platform for the go pro. This was fine, and straight forward. 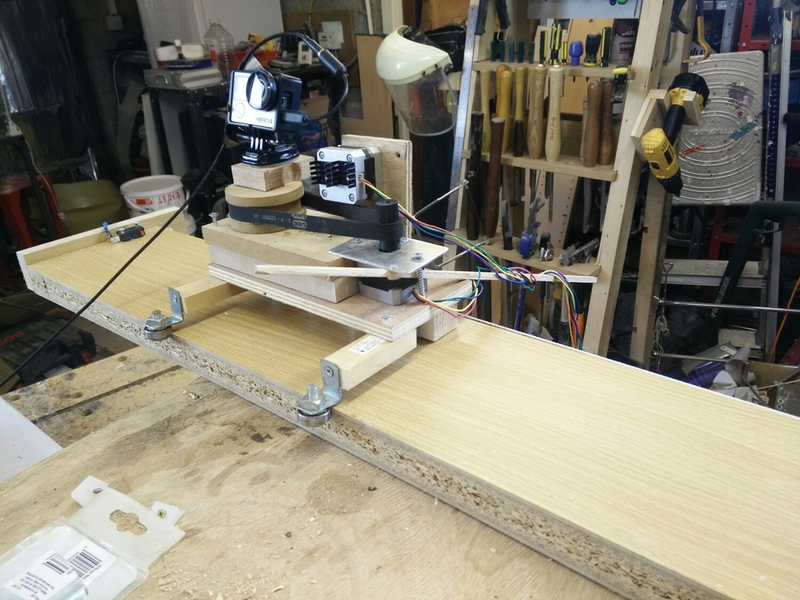 However in initial tests I had to move the motor so slowly to achive the degree of motion I wanted that the stepping was very visible in the video. This wasn't a problem for slwo timelapses, but for more real time video the steps made the video very jerky. So I decided to step down the ratio using an intermediate gear. This is just a chuk of wood with one large dimeter circle and one small diameter circle. The motor spindle is paired with the large diameter, then another belt comes off the small diameter and out to the gopro platform. This allows me to run the motor much faster for the same degree of motion whilst making things much smoother. With the mecanical parts sorted, it just requires some electronics to drive the motors. I already had an arduino from a previous project, along with a pair of stepper motor controllers. These make life relatively easy. You connect the stepper drivers to power and the motors. And you use the aruidno to send step and direction pulses to the step and direction pins of the drivers. I added a microswitch to each end of the track connecting to an input pin on the arduino so it can detect when the platform reaches each end and will reverse the direction signals. The code that runs the whole thing can be found below the video links. The third video below has me walking through the elctronics and the various parts of the program to descibe what they do. digitalWrite(dirpin, LOW);     // Set the direction. digitalWrite(dir2pin, LOW);     // Set the direction. digitalWrite(dirpin, HIGH);     // Set the direction. digitalWrite(dir2pin, HIGH);     // Set the direction. digitalWrite(steppin, HIGH); // "Rising Edge" so the easydriver knows to when to step. //the pan is on 1/8 microstepping, so it take 8 beats to move it a full step. digitalWrite(step2pin, HIGH); // "Rising Edge" so the easydriver knows to when to step. // particular motor. Any faster the motor stalls.